To the best of our knowledge all food is GM free. Our food is prepared in a kitchen where nuts, gluten and other food allergens are present. Our menu descriptions do not include all ingredients. Our coffee is roasted and supplied by Great Brington Coffee. The Sacarello family have been roasting coffee in Gibraltar since 1888. Joe Sacarello continues his craft along side his wife, Sarah, in the Northamptonshire countryside, applying the wisdom and love that has characterised generations of coffee roasting fulfilling his Father’s dream of building a coffee roasting business here, in England. Soft and buttery with a smooth mouthfeel and a rich fruity finish. A crisp, zesty wine made from the rare Picpoul grape. Vibrant green apple fruit with a refreshingly dry and acidic finish. Aromatic and concentrated, with fresh citrus combined with notes of passion fruit, a crisp acidity and lovely structure with a long and persistent finish. A light, fresh and youthful wine, with a zesty and well-defined citrus backbone, overlaid with subtle hints of stone fruits and nectar. A pale golden colour, with characteristic aromas of lime zest & grapefruit, along with subtle hints of fresh fennel. Bone dry with moderate acidity, it offers a clean & refreshing finish. Bursting with aromas of pear, honey, apple, spice and even a hint of cream. Hints of sweetness partner the pure fruit flavours and are complemented by clean acidity, good length and soft texture. Pale golden colour and a youthful citrus nose with spring blossom nuances. The palate is fresh and harmonious, with nicely focused fruit character and a lingering stony texture on the finish. Aromas of ripe rhubarb and gooseberry leap from the pale lemon coloured glass, along with hints of lime, chalk and fruit. Mineral texture, high acidity, vibrant green fruits and a long lingering finish. Very forward with ripe tropical peach and a rich (but not over-powering) use of toasty oak make this a wonderfully full style of Fuisse. Length on the finish is long and harmonious. Just now ready to be drunk, the 2014 is a voluminous wine with fabulous flavours of peach, pear and apple enhanced by subtle woody and nutty notes. Fruity flavours of plum and blackcurrant, with a cassis-like concentration, lifted by subtle green-pepper-like tinges. Easy going tannins provide a ripe and friendly mouthfeel. A soft fruity red with ripe berry fruit and gentle pepper and spice flavours. On the nose rich notes of plum and blackberries lifted by Chocolate & Mocha. Silky yet structured fruit flavours. Deep ruby coloured with smoky black fruits of cassis, blackberry & spice. With soft tannins and a long finish, this wine is eminently drinkable on its own or with food. Deep and inky red in colour, this wine is crammed with black cherry fruit, lifted by subtle vanilla aromas from a touch of oak ageing. This rich fruity wine is made even richer by the use of dried grapes. Packed with dark fruit flavours that are almost amarone-esque. Elegantly structured and showing ripe blackberry and blackcurrant fruit flavours and plenty of peppery spice. The finish has distinct chocolate notes and crisp, refreshing acidity. A finely balanced Pinot offering ripe red berry fruit underpinned by a fresh crunchiness and savoury notes. Tannins are ripe and supple, polished and spice-infused by 9 months in oak. The area has St. Emilion's trademark sand and limestone soils. A medium-bodied claret, with a pleasantly spicy and mature nose, with hints of leather and clove against a backdrop of bramble and dried prune fruit, framed by fine-grained tannins on the palate. An earthy, rustic nose gives up aromas of leather, earth and spices over a backdrop of blackcurrant and ripe raspberry fruit. Harmonious and powerful on the palate, with a cocoa and pepper complexity. This Amarone is made by drying the grapes on bamboo racks throughout winter, after which the dried berries undergo a very long fermentation period of around 80 days in total, in a mixture of steel vats and Slavonian oak barrels. Immensely full-bodied and complex, with intense and mature dry fruit aromas. Blush in colour, with soft floral flavours on the palate and a refreshing, pleasantly smooth finish. Pinot Gris and Pinot Noir are gently pressed to extract colour while minimising tannin. Yeast strains are selected to enhance aromatic intensity. On the nose and palate this wine is all about summer berries matched with a creamy texture. The acidity is well balanced with just the slightest hint of structure from the Pinot Noir. This rosé is quintessential of the local style, with the blend employing the little-known Tibouren grape, a variety grown almost exclusively in Provence. Pale honeysuckle pink, and offering a clean nose of citrus fruit, offset by subtle floral and candied notes. Fresh acidity makes for an incisive and lively palate, with a rounded feel. A delicate and inviting salmon pink, this is a light, crisp and immediately welcoming sparkling rose with a raspberry and peach fruit character. A light, fresh & fruity Champagne with fine discreet bubbles and subtle overtones of apples, pears and citrus fruits. Veuve Cliquot ages their non-vintage for almost twice the required time, resulting in a superb marriage of freshness and power, with rich fruit and a mouth-filling mousse. A relatively recent addition to the Veuve Cliquot stable, this medium bodies rose is reminiscent of the power and finesse of the non-vintage label, with a soft red-fruit core. All wines served by the glass are also available in 125ml measures. Vintages may vary. Please ask for further information on ABVs. Clear and poignant juniper aromas with a light spice. Recommended with Fever Tree Aromatic tonic and served with a twist of lemon. All the botanicals work together in unison to afford a romantic, complex flavour. Fresh, floral and citrus flavours work together with local honey and earthy cassia bark to achieve this smooth finish. Recommended with Fever Tree Premium Tonic water and orange peel. Martin Millers is pot distilled using two separate distillations. This imparts a unique balance of citrus & juniper, bottled using Icelandic Spring Water to give artic clarity. Recommended with Elderflower Tonic and a Strawberry with cracked black pepper! Malfy Gin is an Italian Gin made using a selection of six botanicals, as well as an infusion of Italian coastal lemons, including some from the Amalfi coast. Recommended with Fever Tree Mediterranean Tonic with Lemon. Intensely smooth with a soft, fruity character derived from a careful botanical selection. Italian Juniper berries provide pine, lavender & camphor notes. Spanish lemon & orange peel add zesty citrus. But the unique use of dried blackberries & blueberries give Brockmans’ its distinctive taste. Recommended with Fever Tree Lemon Tonic and a wedge of orange. 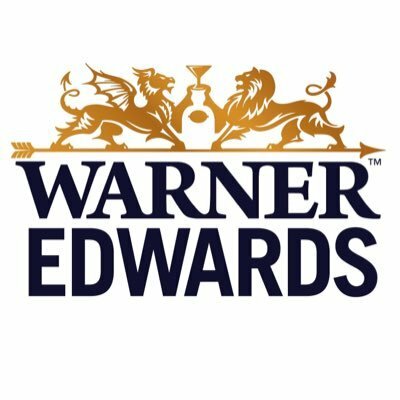 From a 200 year old barn on Falls Farm in the picturesque village of Harrington, Northamptonshire, Warner Edwards distils a range of small batch, fantastically smooth , award winning gins using the farms natural spring water, grain spirit and home-grown ingredients.